Polypropelene Resin THE LIBMAN Company. The A-Ward 40ft Tilt and Raise Container Unloader system allowed their container to be emptied outside, saving in warehouse costs. The Libman Company in Illinois, USA challenged A-Ward to supply a 40ft container unloader that had plenty of working space at the open doors when tilted at 50 degrees, to allow for safe and easy operator connection for resin extraction. The 40ft containers would be unloading Polypropylene resin from a container liner outside and can’t have any possibility of water or contaminate damage. The design also had to be easily remote controlled by one operator. A-Ward worked with our local agent Foremost Machinery to design together a turnkey resin unloading solution. This resulted in the A-Ward 40ft Tilt and Raise Container Unloader with a fifty degree maximum tilt angle, fitted with a hydraulic roof protection option. 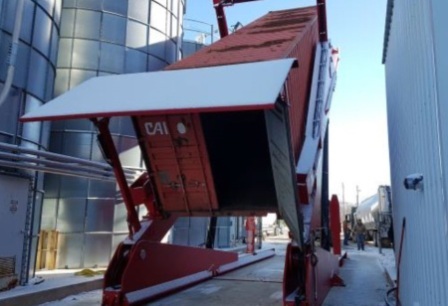 A-Ward built an easy to operate but technically advanced geometric “Tilt and Raise” style Unloader for a 40ft container, to give a 1.6m (5’3”) clearance from the opened container door to the ground. This system doesn’t require special transportation and could hold the fully loaded container in an elevated position for extended periods during unloading. >Minimal supply chain risk, mitigating supply shortages and paying only global prices in the future. >An integrated roof protection option, for weather proofing in all conditions, even snow. >A dry environment to store operator’s evacuation equipment, supplied by Foremost Machinery. >Security of supply in the future through the new container handling system. Libman Company are very happy with the new design and the extra efficiencies this has enabled.